Scratched Computer Screen? A scratch on your computer monitor or LCD TV screen can be annoying and very noticeable. The scratch on your computer screen will seem even worse and more visible when the background is white. How can you make that big scratch disappear? We have a few tips below that will completely erase the scratch and make it invisible. You won’t even have to go buy anything to fix the screen. The things needed to fix your screen are already in your home. A very light scratch on your computer screen can be removed with a pencil eraser and by rubbing lightly. Another product you can use for a light scratch is rubbing alcohol. Add a small amount on a cotton ball and rub the scratch gently until it fades away. A deep scratch on your computer screen can be removed or repaired by using a substance that can get deep down into the scratch and make it disappear. Wipe the screen down with a cotton or microfiber cloth. Get some hand lotion or petroleum jelly and add it to a cotton ball or your finger. Gently push the hand lotion or petroleum jelly directly into the scratch. 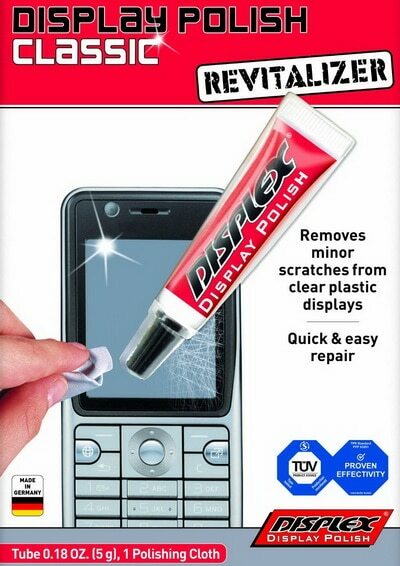 Use as much as you need to “fill” the scratch. Let the jelly or lotion sit in the scratch for a few minutes. After a few minutes, use the cloth and gently wipe away the lotion or jelly. Do not wipe with too much pressure as you want to leave some of the substance in the scratch. Repeat if needed until the scratch has disappeared. This screen scratch repair method can be used on all Computer Screens, DLP Screens, Flat Screen TV’s, LCD Monitors, Laptop Screens, LED Screens, Plasma Screens and more. 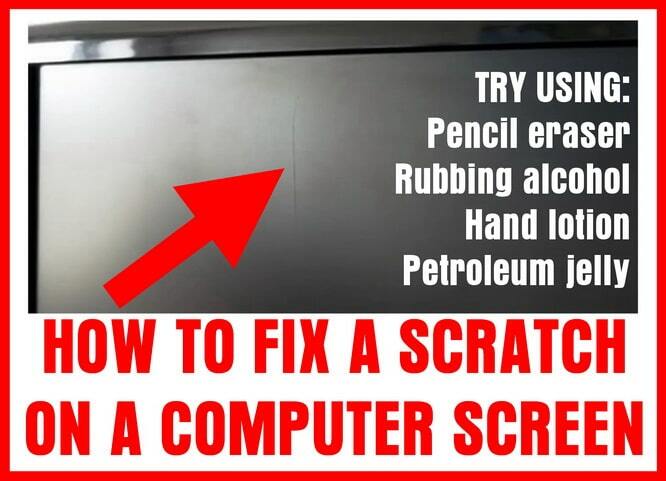 NOTE: If you have a scratch on your screen or monitor that cannot be removed using the methods above, there are a few different scratch removers you can try. Cell Phone Screens & Personal Gaming Devices. CD’s, DVD’s, Video Game Discs, LP’s. Trim & Screens for Plasma TV’s, LCD TV’s, LED TV’s & Computer monitors. Phone Screens & Personal Handheld Gaming Devices. CDs, DVDs, Video Game Discs. LED TV’s, Plasma TV’s, LCD TV’s & Computer screen monitors. If you have a scratch on your computer screen or TV screen you cannot repair or remove, let us know by asking your question below and we will help you find a solution to fixing a scratch on any type of screen. Hi. Not sure if you still monitor comments on here, but I was wondering if you would know how to repair a very small hole (maybe 2-3 pixels wide) which goes all the way through the polarizing film layer on an LED lPS laptop screen. Would buying a small square of polarizing film from Amazon, cutting a tiny piece, and placing it in the hole work? I got multiple light scratches on my laptop’s LED Screen. It’s not the matte finish found in most LCD Monitors, but rather the hard glossy one, similar to most touchscreens on smartphones today. 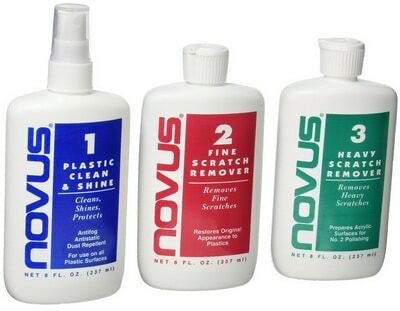 I already got Novus Plastic Polish Kit, but I would like to know if this is safe to use. I know that it is abbrasive, that’s why I am doing a bit of research before trying it out, as I may worsen the existing problem. Hey does scratches show when they the monitor is on? I just got this monitor as a present but my mom pushed into the screen by accident and there’s a few small white scratches. This is a really important present and I’m really worried. What type and model number is the monitor? Is the screen cracked or pushed in and leaving the screen discolored? The white scratches can be temporarily removed by using vaseline. Rub some vaseline on the small scratches while the monitor is on and you will see them disappear. The only bad part is when the monitor is off you will see the vaseline. I have two scratches on my chromebook. I think chromebooks have different type screens or something. I think the scratches are pretty deep. They are also really visible. Previous post: Air Conditioner Air Filter – Which Way Do The Arrows Point? In Or Out?